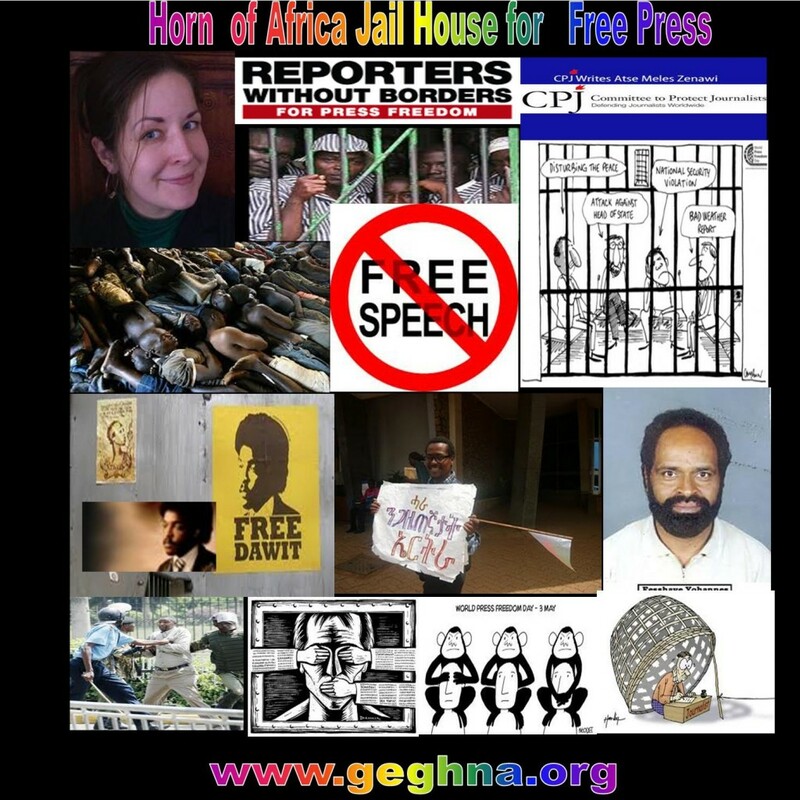 The Horn of Africa is known being the Jail house of the world Journalist. In the past twenty years many has been kidnapped, jailed and even killed. Some are still languishing in prison with no appeal. In the Horn a journalist either put in jail by the government or kidnapped by the rebels for ransom or recognition. Many diaper without knowing there where about. Only those journalists known by the media are reported, the small local reporters working on the ground are persona non Grata. Eritrea (178th) is at the very bottom of the world ranking for the fourth year running. At least 30 journalists and four media contributors are held incommunicado in the most appalling conditions, without right to a trial and without any information emerging about their situation. Journalists employed by the state media – the only kind of media tolerated – have to choose between obeying the information ministry’s orders or trying to flee the country. The foreign media are not welcome. Freelance journalist Seyoum Tsehaye, a veteran of Eritrea’s independence war against Ethiopia and a former head of state-owned Eri-TV, was arrested in Asmara on 21 September 2001. Now he is prisoner No. 10 at Eiraeiro, a prison camp in the northeast of the country. A reporter for state-owned Radio Dimtsi Hafash’s Oromo-language service, Daniel Mussie was arrested in November 2006 following the defection of several well-known journalists, because the authorities suspected him of staying in contact with the fugitives or seeking to flee himself. 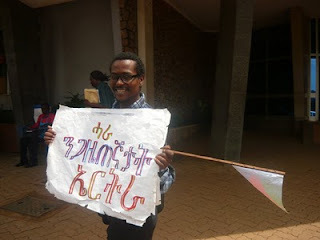 He is being held in Adi Abeito military prison, in the northwestern outskirts of Asmara. Yirgalem Fisseha Mebrahtu, one of Eritrea’s few women journalists, was aged 27 when she was arrested on 22 February 2009 at Radio Bana, a small radio station broadcasting educational programmes under the education ministry’s supervision. She has been held in solitary confinement for months in May Srwa prison, just to the north of the capital, without anyone knowing what she is alleged to have done. In all, around 30 journalists are festering in prisons in Eritrea. Some of them have been there for years. (AFP) – Swedish-Eritrean journalist Dawit Isaak is one of the inmates in the Eritrean “death camps” where political leaders and journalists have died. Six former Eritrean government officials and a number of journalists have died in prison since their incarceration nearly a decade ago, a former prison guard said on Thursday. Former vice president Mahmoud Sherifo, military chief of staff Ogbe Abraha, and central committee members Aster Fisehatsion, Germano Nati, Hamid Himid and Salih Kekya were part of a group of 15 high-profile politicians that criticised President Isaias Afeworki and asked for reform in 2001. The six were among the eleven members who were subsequently rounded up and sent to the remote Embatkala and Eraeiro camps where temperatures can soar to up to 50 degrees Celsius (122 F). “Ogbe tried to commit suicide but failed before he succumbed to asthma six months later in 2002. Mahmoud died from a neck infection in 2003,” Eyob Bahta told journalists three months after fleeing to Ethiopia. “The other four all died from illness and heat exhaustion. They were never given proper medication or food,” he added. The former guard said the remaining five were still alive but extremely ill, including former foreign minister Haile Woldetensae, who has lost his sight while in prison. Eyob, who took his position as head of the camp’s ten guards a month before the round up, said there were 35 inmates in 2001 but 15 have died ever since, including five journalists. “One of the journalists had committed suicide, while the rest all died of illness,” he said. Swedish media and rights groups demonstrated Monday demanding the release of Swedish-Eritrean journalist Dawit Isaak, who is one of the inmates. The groups called on the European Union to halt aid to Eritrea until his release as well as the closure of the “death camps”. Authorities in Asmara were not immediately available for comment. Rights groups say Eritrea has turned into a “giant prison” where detentions, torture and prolonged military conscription have become rife since a 2001 crackdown. In addition to the 49,000 Eritrean refugees in Ethiopia, hundreds arrive every month to neighboring Sudan, according to the UN’s refugee agency. The temporary lifting of prior censorship on the print media in Sudan (172nd) was just a smokescreen. It has fallen 24 places and now has Africa’s second worst ranking, partly as a result of the closure of the opposition daily Rai-al-Shaab and the jailing of five members of its staff, but above all because of the return of state surveillance of the print media, which makes it impossible to cover key stories such as the future referendum on South Sudan’s independence. In Somalia (161st), the media are not being spared by the civil war between the transitional government and Islamist militias, and journalists often fall victim to the violence. The two leading Islamist militias, Al-Shabaab and Hizb-Al-Islam, are gradually seizing control of independent radio stations and using them to broadcast their religious and political propaganda. Ethiopia ranked 4th in the horn of Africa with 139 place as a jailer and killer and banner of free expression….. a regime that puts in jail and work on you and let you go astray ..
Surveillance of the press and a decline in the climate for journalists during the May elections account for Ethiopia’s continued bad ranking (139th). Violence against journalists, arbitrary police arrests and intelligence agency abuses explain why Nigeria (145th) and the Democratic Republic of Congo (148th) are still in the bottom third. Djibouti 110th place took the 5th position famous for pardoning and jailing back ..
Reporters Without Borders has protested against the re-arrest of newspaper editor Daher Ahmed Farah on 5 June, just two days after his release, and has called on the authorities to set him free at once. The editor of the newspaper Le Renouveau and head of the Movement for Democratic Renewal and Development (MRD), Farah is the subject of several libel suits by the armed forces. Reporters Without Borders is shocked by the murder of Francis Kainda Nyaruri, a freelance journalist based in the southwestern town of Nyamira, whose decapitated body was found on 29 January in a nearby forest. He had been missing since 16 January. Uganda ranked 5th in the Horn of Africa ranking 96 from 178 in general index. A total of 15 journalists are currently being prosecuted in Uganda, facing sentences ranging from several months to several years in prison. Most of them are charged with criminal defamation or sedition. One of them, Patrick Otim of Mega FM, a station based in the northern city of Gulu, is facing a possible death sentence on a charge of treason. Arrested in June, he is accused of being a member of the rebel Uganda Patriotic Front. Kenya is the best in the Horn of Africa concerning freedom of Press compered from its neighbours ranking 71st from over all. Reporters Without Borders has written to Kenyan President Mwai Kibaki urging him not to sign the Kenya Communications (Amendment) Bill 2008 into law. Otherwise known as the ICT Bill, it was adopted by parliament on 10 December.